UnForm document archiving and management is an optional component providing a suite of archiving functions which are seamlessly added to UnForm's library of commands and tools for document enhancement and delivery. Existing UnForm integrators and designers familiar with Unform's unique text filter technology will find it simple and intuitive to add archiving commands and arguments into UnForm's rule-file oriented flow of processing. Or rule-files can be bypassed altogether to archive non-UnForm-generated documents using the familiar command-argument interface to the UnForm client software. And UnForm's Image Manager component can add scanned image files to the archive and match them with existing documents previously stored using barodes, OCR, or custom form interfaces. 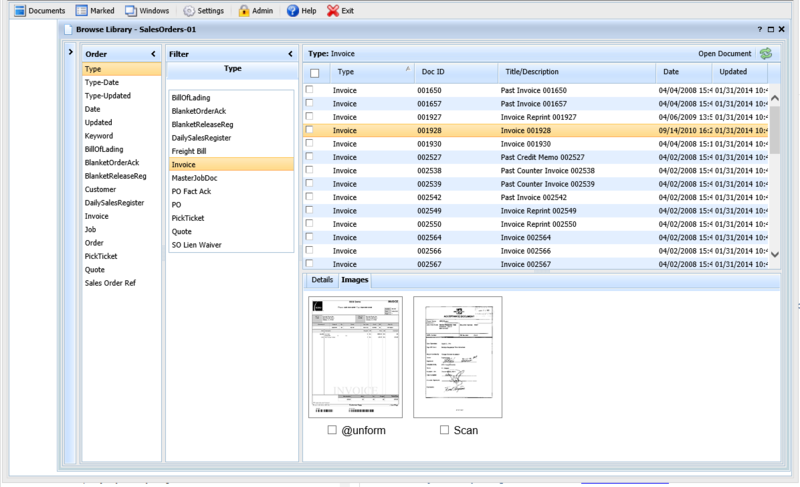 Once documents are stored, UnForm provides many retrieval capabilities. Users are provided a browser-based application with single document lookup, indexed browsing, and full featured searching. Documents can be viewed, emailed, faxed, or printed right from their browser. 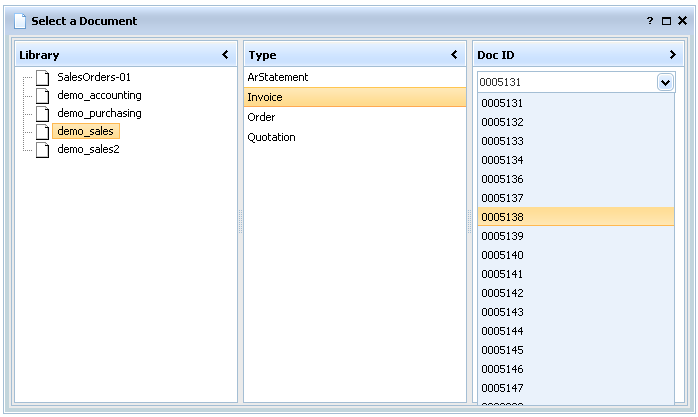 Multiple documents can be selected and then viewed or delivered as a unit. Developers can access documents as well, through an http-based REST interface, or the command line client. Using these methods, custom applications can be designed that interface with documents stored in UnForm libraries. Subject to access-rights, document and images being listed and/or viewed in the browser interface can have properties modified by users to update document status, correct indexes, and maintain associated notes and keywords at a document level. Files on the network can be browsed and added as sub-documents from within the browser. Security is managed by library and by user. All documents are encrypted and compressed when stored in the library. To access documents, a user login is required, and each login can be granted read, write, or delete access to a given library, or can be allowed to access the library based on the library's default access profile. Libraries can store millions of documents, but through intuitive indexing, both automatic and custom, users can easily browse documents of interest. Dates, types, keywords, and custom multi-level category indexes make quick work of even huge libraries. 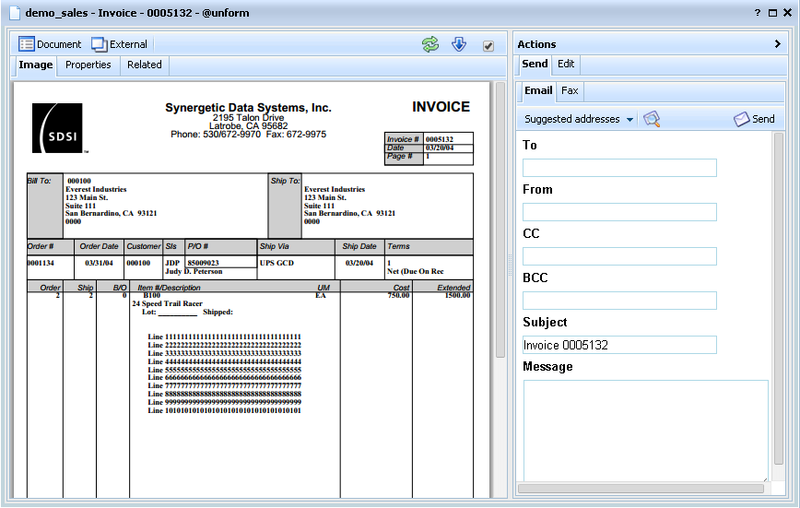 Documents are viewed on screen, with email and fax panels easily accessed. Quick links to related documents, as well as image details, are also a click away, as well as the ability to mark any number of documents for further handling. The multi-library search function creates a list of documents which can be viewed, exported, or copied or transferred to another library. 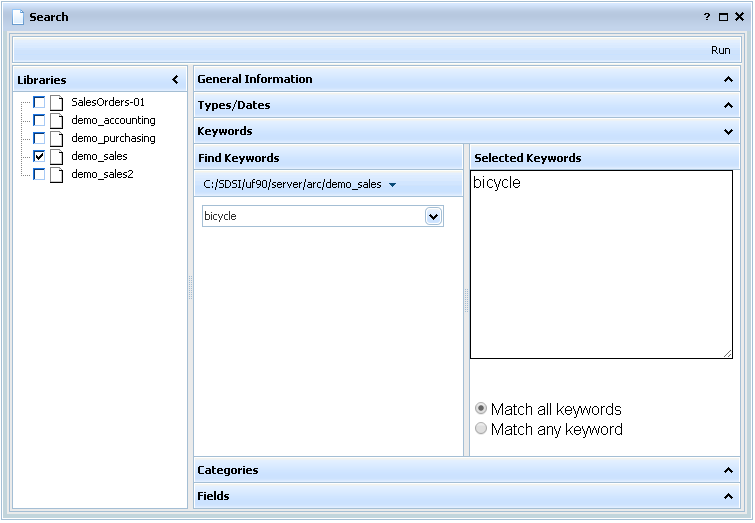 Searches can be based on dates, keywords, categories, or even text content. Searches can be saved for re-execution at any time, and administrators can create standard searches that all users can run (with appropriate permissions, of course). Once the search result list is produced, use it for many purposes. You can copy documents to another library. You can purge documents, by transferring them to a temporary library that can be deleted. Or create a stand-alone HTML export that can be sent to a customer, or an auditor, or anyone who needs access to the documents without full access to the system. 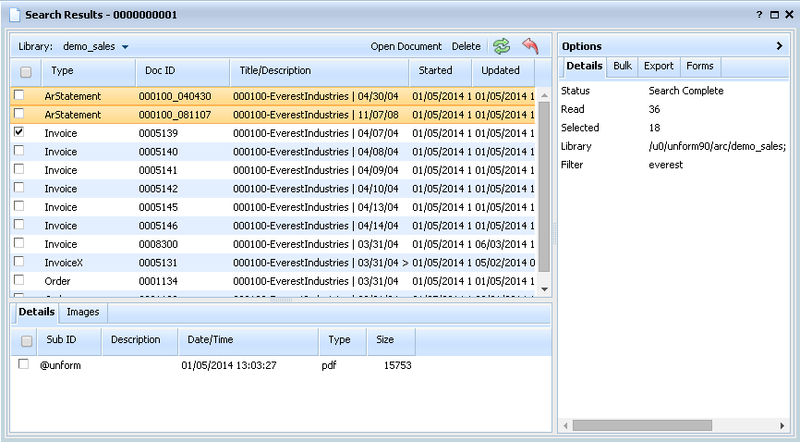 When a document ID is known, the OneDoc feature provides quick access. Select the library and document type, and start typing the ID, such as invoice number or PO number, and click the ID desired from the list. View several documents side by side, for comparisons, three-way match, and other sign-off and auditing applications. The UnForm manual has more details about archiving , including detailed information about the structure of document libraries and examples.